It doesn’t yet have a fit on prairie farms, but the 25-horsepower, all-electric tractor has finally become a reality. No, this is not a hybrid. There is no liquid fuel. Introduced to the North American public three months ago by Motivo Engineering in California, the Harvest tractor is simply a big battery on wheels. The complex electrical system takes power in through a variety of renewable energy sources, such as solar panels, water wheels, wind turbines or even intermittent electrical grids. It stores electrical power on-board and delivers it when and where required, putting power out to a large number of electrical tools and farm implements. It operates in AC or DC modes. Motivo calls it a Mobile Power Conversion and Distribution System. It was created to help developing countries meet increasing food demands without depending on costly petroleum fuels. 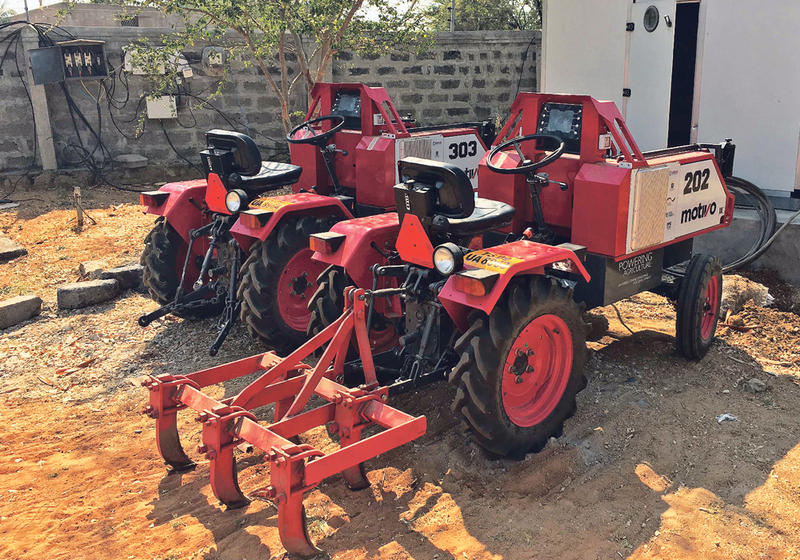 According to a Motivo news release, each Harvest unit working in a small test fleet in India reduced operating costs by US$2,516 per month compared to small conventional diesel tractors in the same power range. Small tractors in this power range are popular throughout the developing world. The power take-off is just one example of Motivo engineers thinking. The 540 rpm, Type 1 p.t.o. can drive any tool designed for low horsepower p.t.o. When it’s time to charge up for the night, the operator can hook the waterwheel to the p.t.o. and back the Harvest down to a flowing stream, at which point the p.t.o. function is reversed so it charges the tractor. Motivo strategist Chris Laudando says the transit range on a fully charged battery is 45 miles empty and 25 miles carrying a 3,300 pound load. Pulling a plow, the Harvest can do five acres before running out of steam, or three acres running a rotary tiller. Re-charge time is four hours using a dozen 300-watt panels. Charging from a grid with a small five-amp circuit takes 13 hours, or five hours using a larger 15-amp circuit. The power modules are removeable so one pack can be working in the field while the other is charging. Given the large number of sunny days around the equator, solar charging will be the most common source of power. Power modules can be tied together to form a micro-grid with scaled up output capability. This is a ‘swiss-army knife’ for agricultural power. “In terms of nutrition and food safety, the lack of refrigeration is a major issue in rural areas of developing countries,” said Laudando. The Harvest unit can chill 265 gallons of milk in a day. You can transport 26.4 gallons about 35 miles on the tractor itself. Using a refrigerator on the trailer, you can transport 264 gallons of milk 20 miles. The tractor weighs 1,650 lb. ready to work. Each power module weighs 650 lb. Lift capacity at the hitch is 1,715 lb. Top speed is limited to 18 mph. “The intent is not for any single individual farmer to own the Harvest tractor. Small-scale farms in developing nations only need tractors occasionally, thus making one unit available to a large number of farmers. “This could be in a co-op type arrangement with each farmer only paying for the hours he puts on the tractor. Each unit can be rented, tracked and updated through the cell network, resulting in increased year-round utilization compared to a traditional tractor. The Motivo Harvest is expected to be at the 2019 World Ag Expo, Feb. 12-14 at the International Agri-Center in Tulare, California.